Sometimes it feels like the universe is conspiring to remind me of connections. 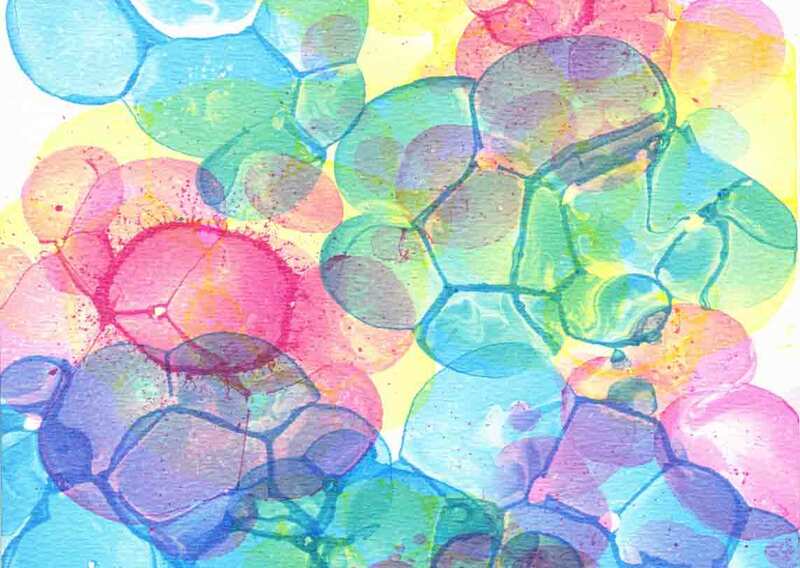 Years ago I played around with decorating papers with colored bubbles. “Bubble marbling” is a simple technique that can create some really fun images. 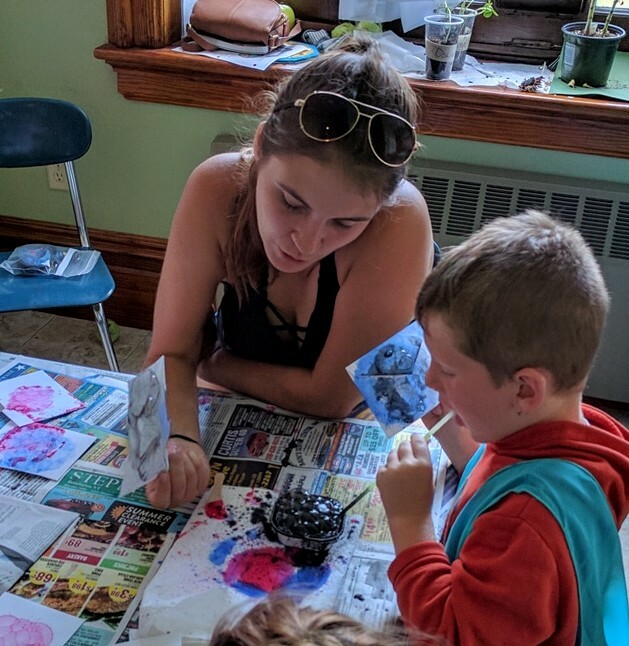 I’ve hardly ever done this with kids because it can get really messy. 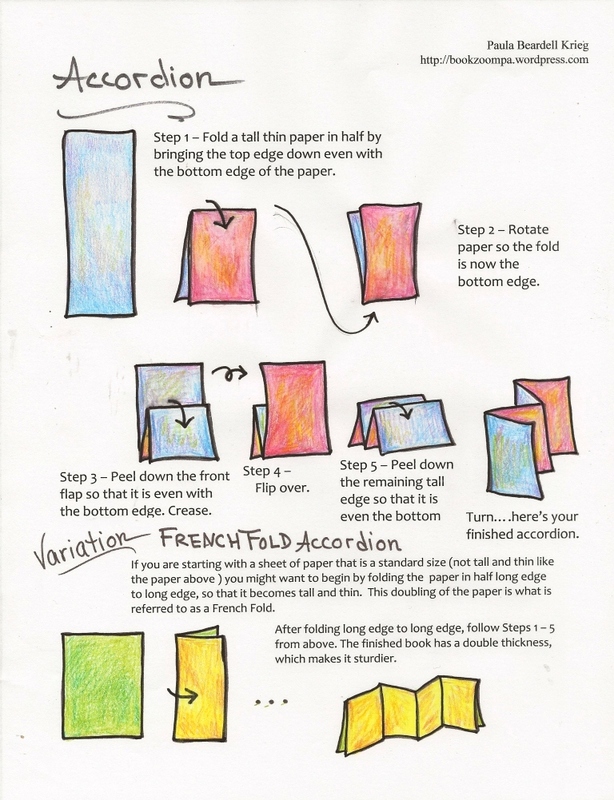 I did teach it in an adult workshop at Dieu Donné Papermill, NYC many years ago. 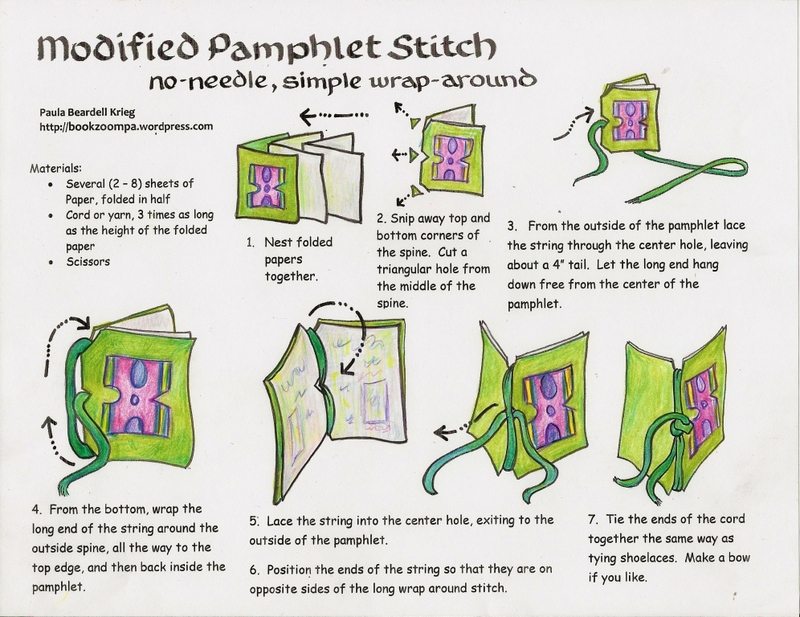 It caught the eye of Helen Heibert, and, in 2001, she included an image I made with a brief description of the technique in her book, Paper Illumninated, which is a gorgeous collection of instructions about making paper lanterns. hey, look, I’m in this picture! 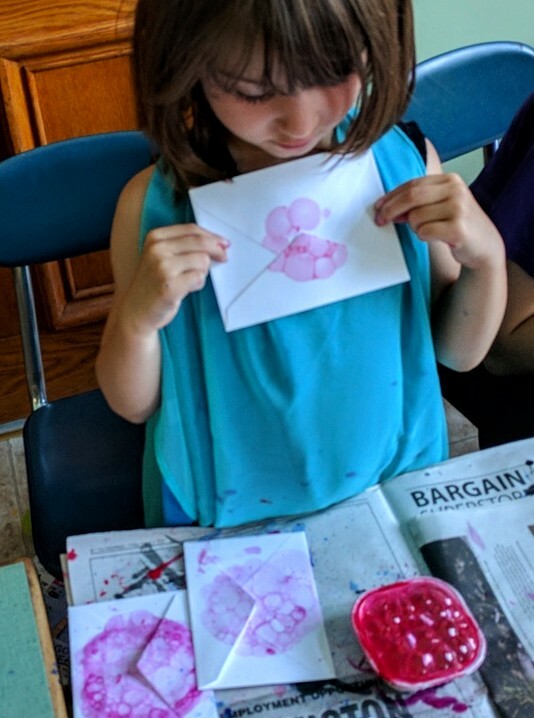 Yesterday I showed this bubble technique to groups of kindergartners. By delightful coincidence, I also heard from Helen Hiebert yesterday. Helen is still making paper lanterns. 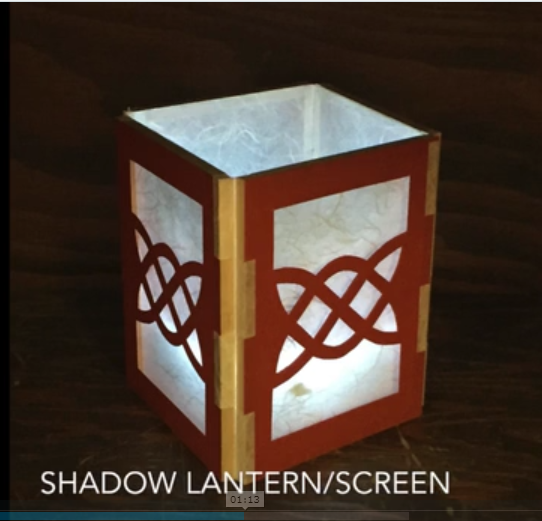 With the proliferation of LED light strips and other safer options for illumination, paper lanterns make so much more sense now then they did it 2001. Helen was telling me about the on-line course she is teaching, which sounds fabulous, so I am sharing this info with you, too before going on about bubbles any further. You can learn about the bubble marbling from me. Now. While it’s not required, it’s not a bad idea to dress up before making a mess. This sets a mood, but it also protects clothing. Here’s what to do: put about a tablespoon of paint (tempra, acrylic, any strong pigment but not ink because you would need too much) in a fairly shallow container, preferably round. Add bubble mixture. I buy this ready made, or make it with Ultra Dawn, water, and a touch of glycerin. Now mix the paint REALLY REALLY well with the bubble solution. 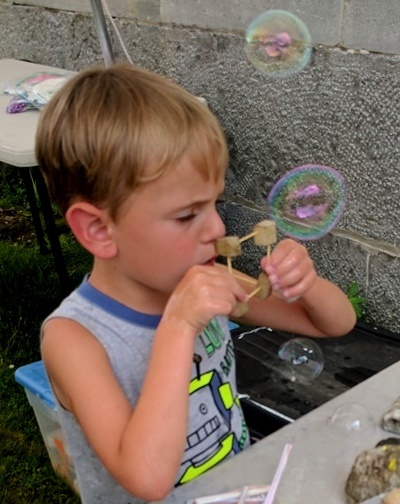 Place a straw in the bubble solution, blow gently, like blowing bubbles into milk. Make the bubbles just high enough to be above the rim of your container. 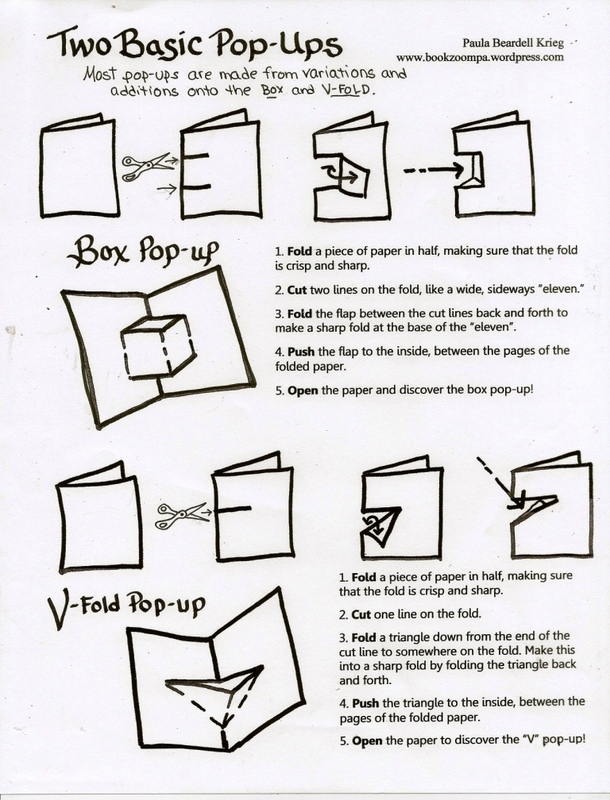 Then GENTLY lay a piece of paper onto the bubbles and remove. That’s it. They dry fast. You can overlay colors on top of each other. So much fun. But there’s more. There’s something to notice. 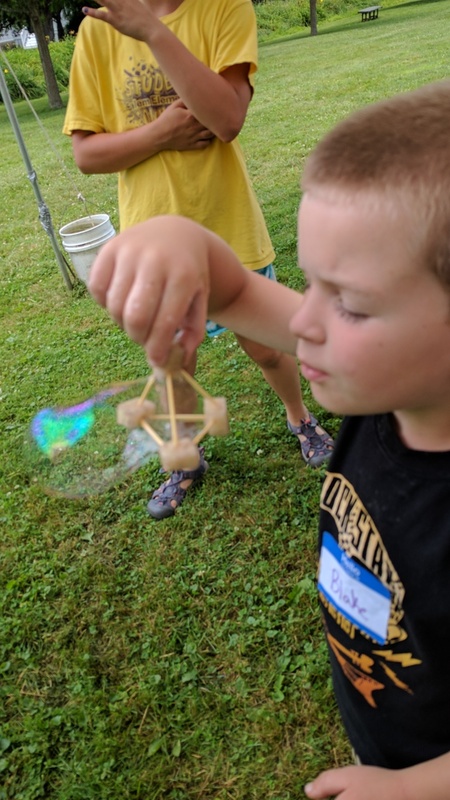 I showed them that the shape we used to make the our three-fold symmetries is the same as the shape that the bubbles make where they meet. And everywhere they meet they make this same shape. Now that’s a connections worth noticing. They loved seeing this. Then they said, It looks like a soccer ball! 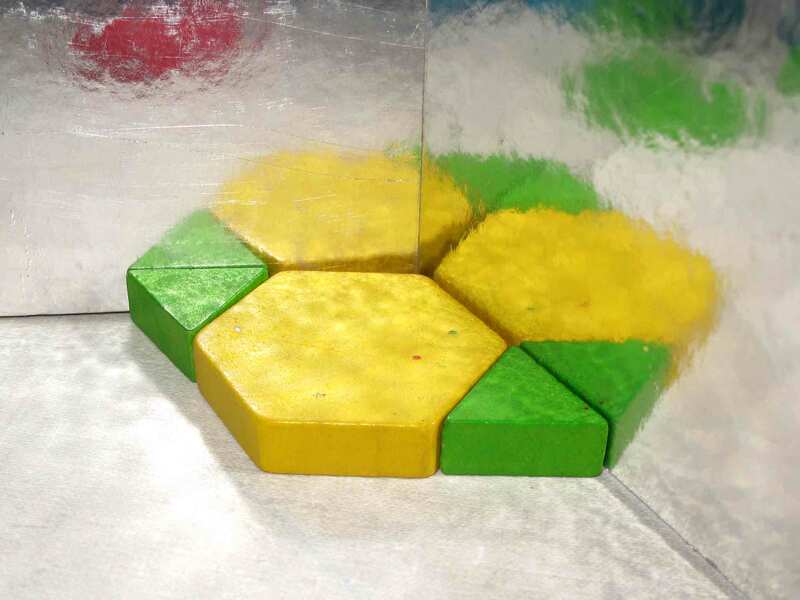 I’m learning that anything that looks like hexagons reminds kids of soccer balls. I can live with that. It’s summer. We’re surrounded by nature here in rural upstate New York. 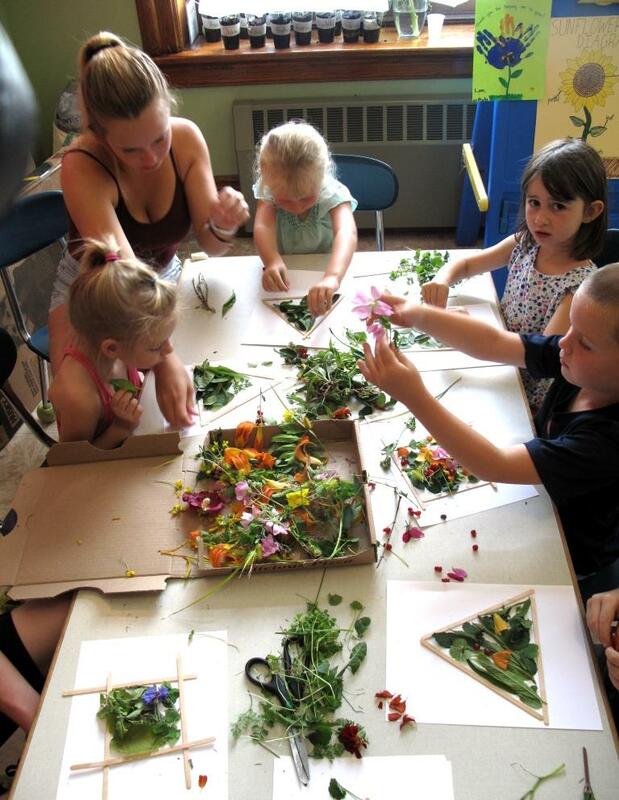 There’s no question that I want the kids that I am working with to play with plants.. 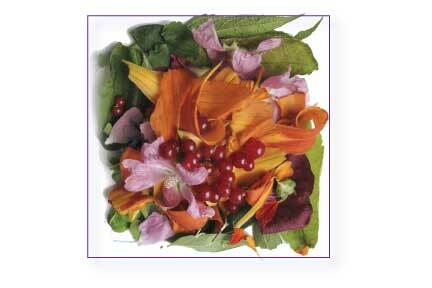 I haven’t had much practice with using summer-time foliage in my workshops. Well, I have more practice now. 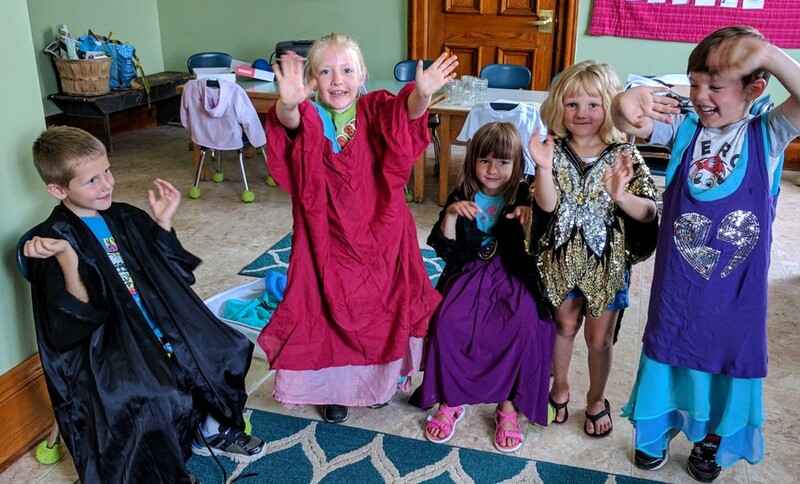 I tried out a couple of ideas with my groups of soon-to-be-kindergartners. 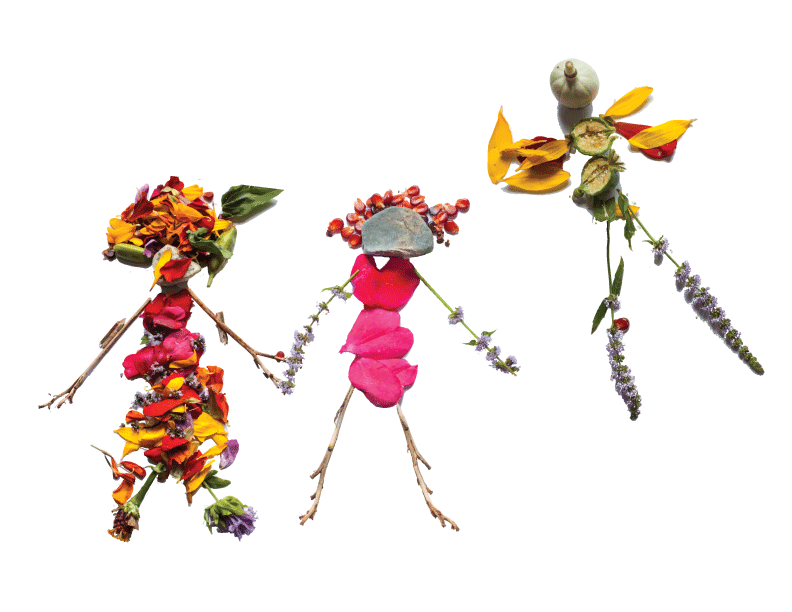 The little figures pictured here are the second project we did with things gathered from my backyard. I can’t stop looking at them, I like them so much. I have goals that this project fulfills. 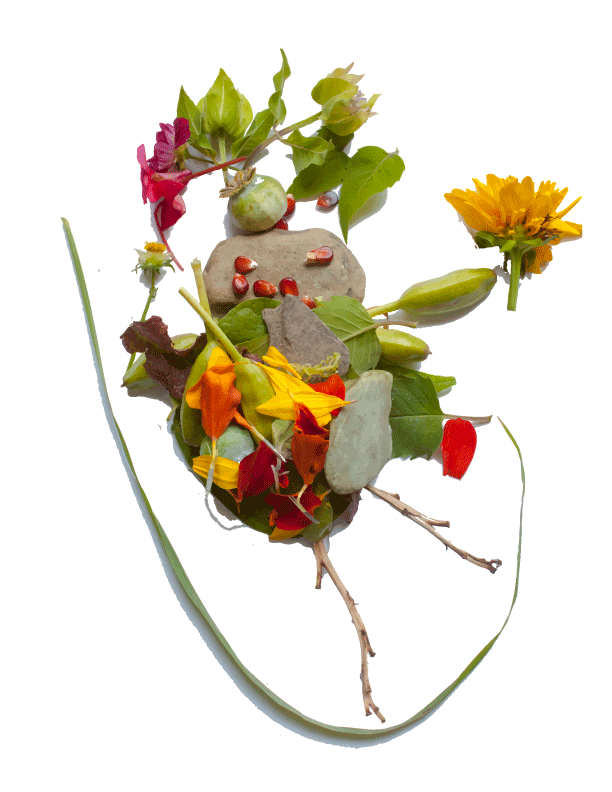 I want the children to use their fingers mindfully, which is necessary to place the materials just so. I want to notice the shape of plants, including learning that most plants have round stems but mint plants have square stems, which they can feel when rolling the stems between their fingers. I want to talk to them about the names of plants. 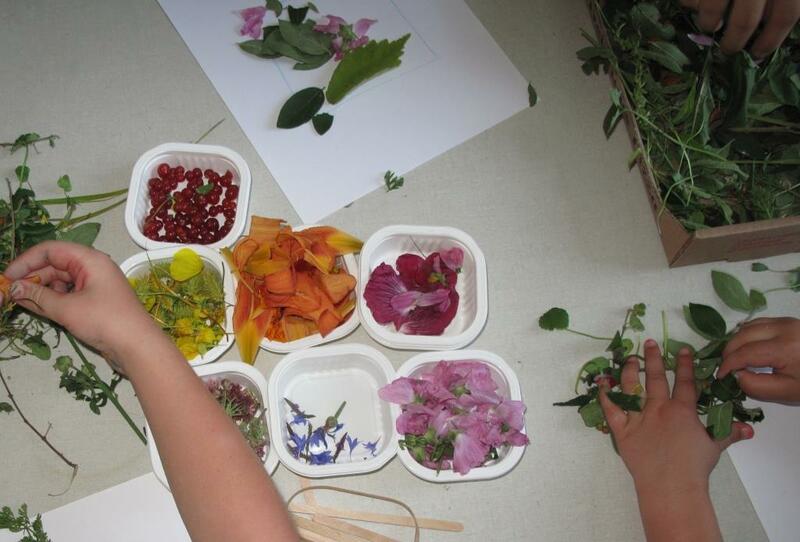 One of children surprised me by knowing the names of many of the plants: his “Nona” taught him. 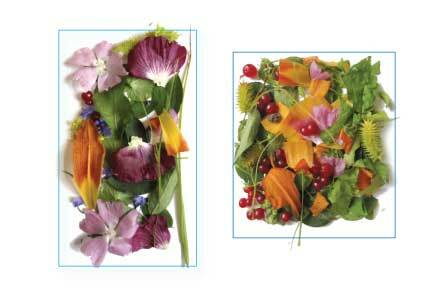 The first plant related project I did with these kids had to do with geometric shapes. I found out that straight lines and plants don’t go together well. 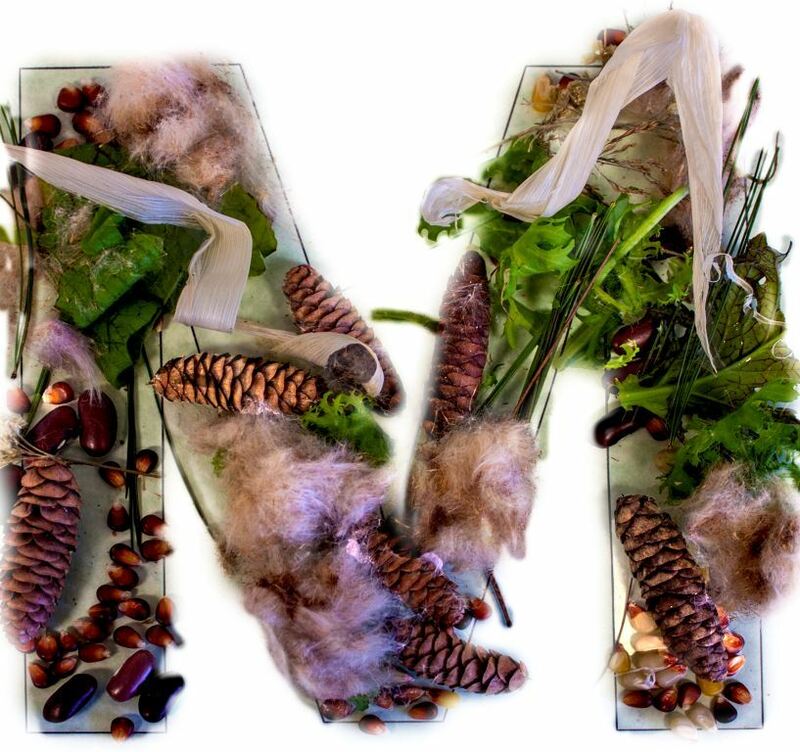 Because I’ve done projects like this with numbers and letters, it seemed just fine to me to expand into doing shapes. Wrong. I realized too late that doing geometry with plants is different than using plants so make numbers. 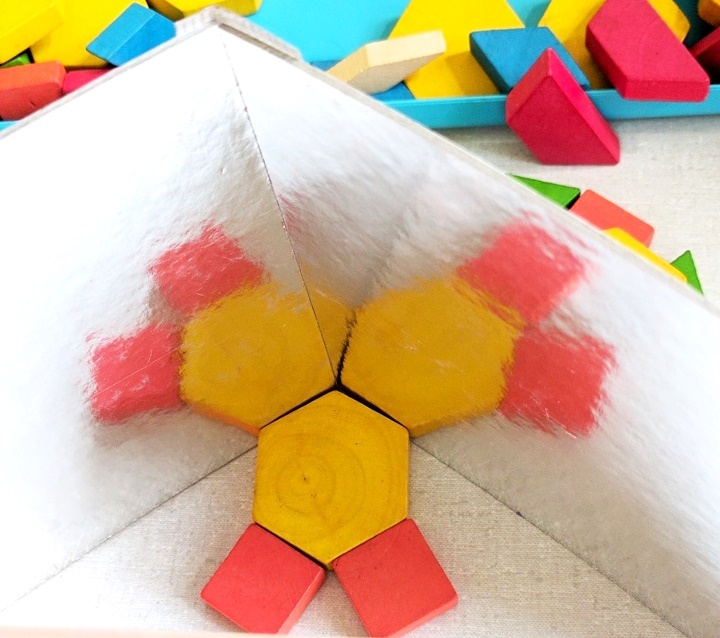 The defining difference for these projects is that a wonky number 5 is still a five, but a wonky square is something entirely different from a square. I compensated for the geometric imprecision by photoshopping in the requisite shapes. 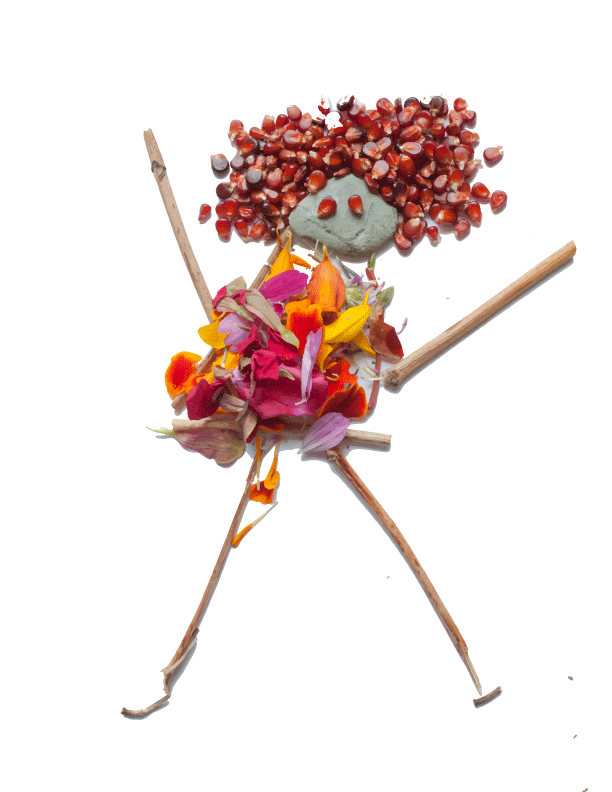 I brought these photo reproductions of the childrens’ work in the week after we made them. 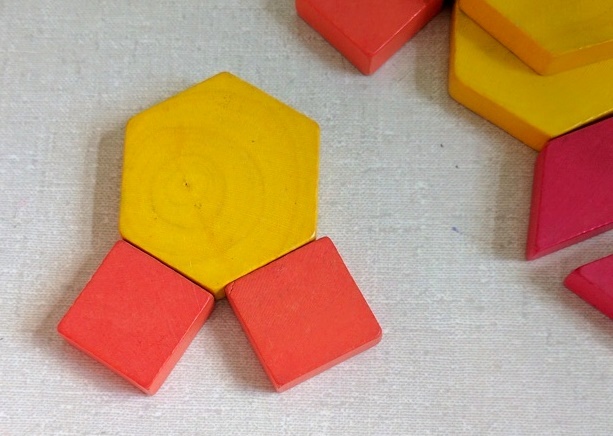 I loved how the kids were up for me challenging their logic: What are these shapes? Triangles! Are they the same shape? NO!!! Huh? But you just told me they are both triangles, so they must be the same shape?!?! NO!!?! They’re different shaped triangles! Tomorrow is the last day I see these kids. 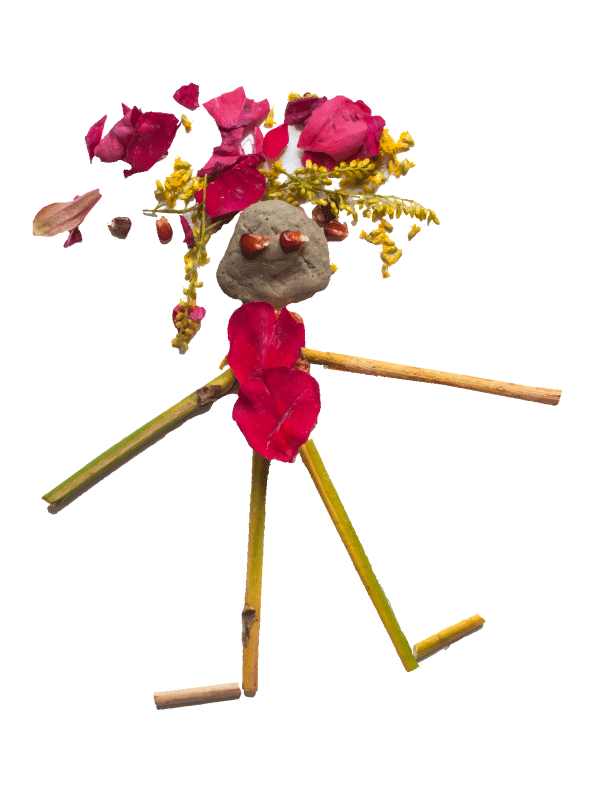 I will be bringing in cards with the flower people on them, and we’ll play a game with them that works on using words that describe relationship and position. I’ll be taking notes and writing about how that goes. In the meantime, I’m just loving looking at these pictures. I have way too many photographs for a single post. 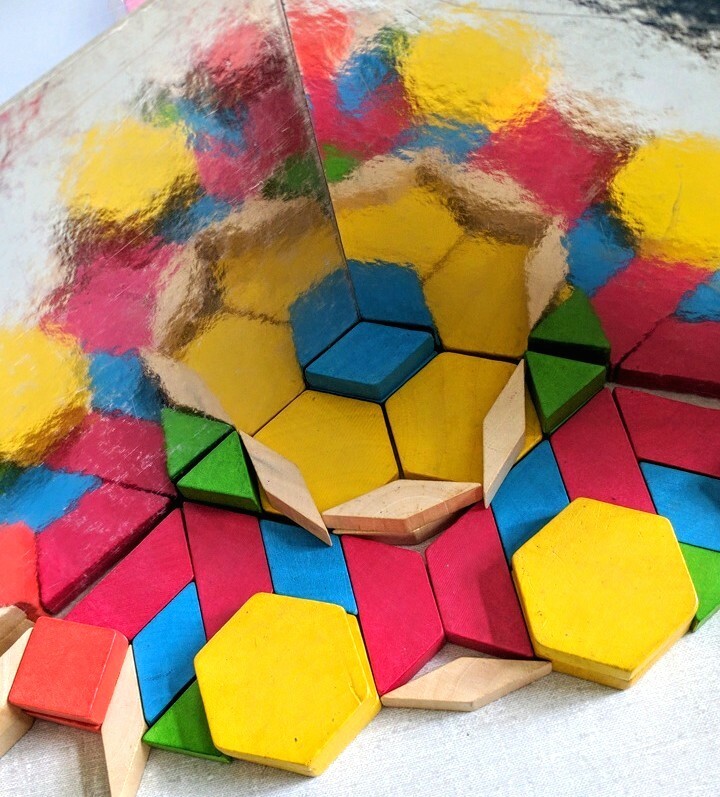 Although only about a dozen 4-and 5-year-olds were with me yesterday playing with symmetry, they were so engaged and made so many beautiful images, both simple and complex, that I got carried away with taking pictures. 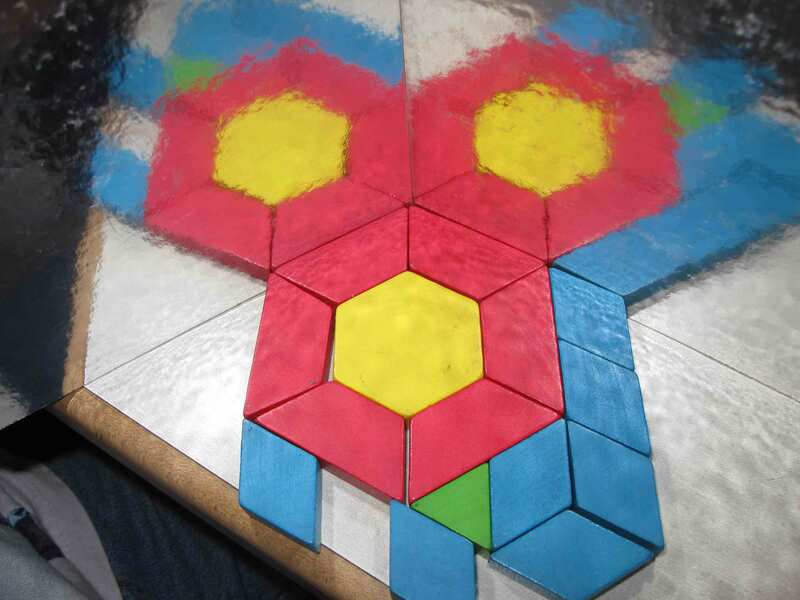 Here’s how it went: first I talked with the kids about symmetry, how their own two eyes, two arms, two legs, and two ears are expressions of symmetry in nature. 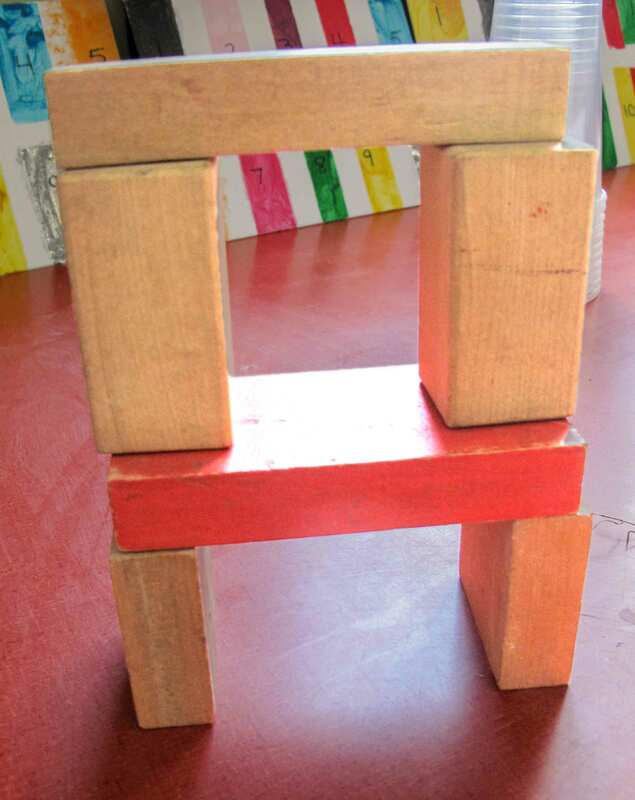 We also looked at how using symmetry makes things that are built stronger. Then I talked about the visual beauty of symmetry, about reflections, and then about other kinds of symmetry, where something is reflected not just once, but multiple times. 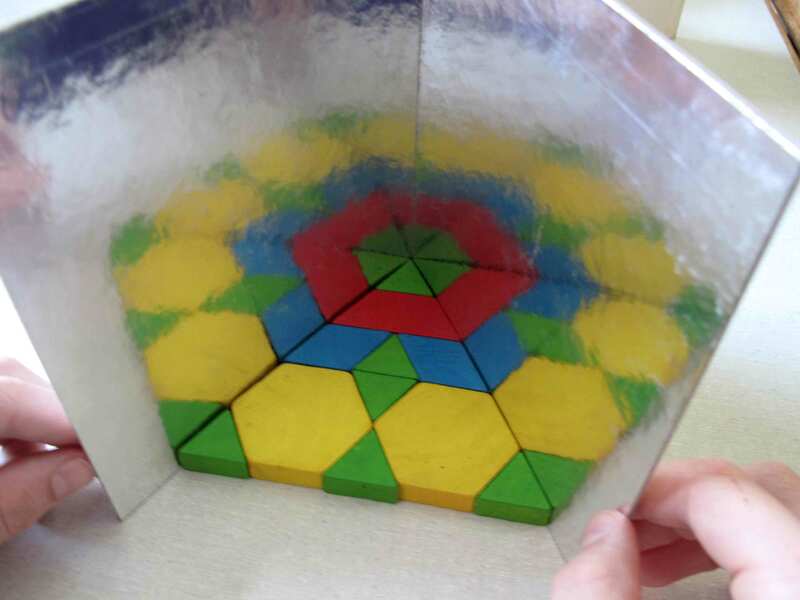 I had cut up some reflective mat board and adjusted them to be able to fit around a point of a hexagon. 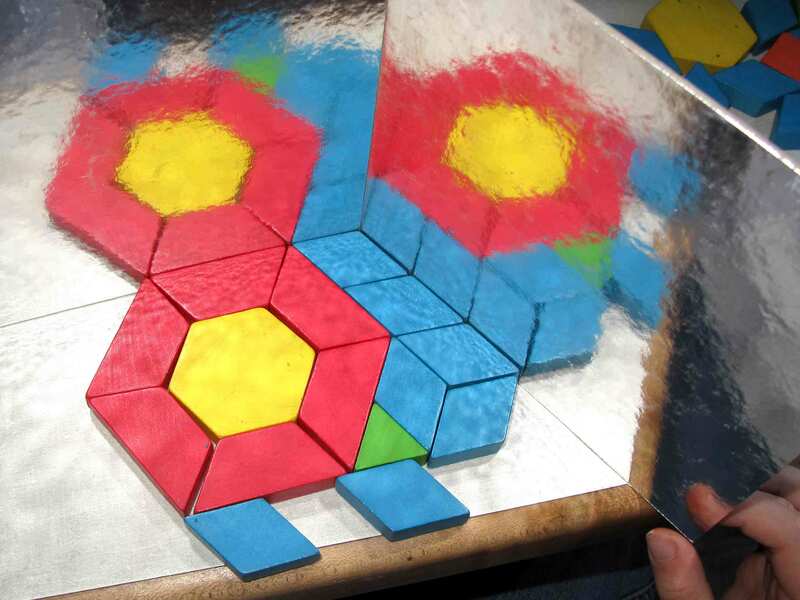 The children used colored tiles to make designs that could be reflected. But soon their designs became more complex. No matter how their explorations went, they were wowed by the reflections. 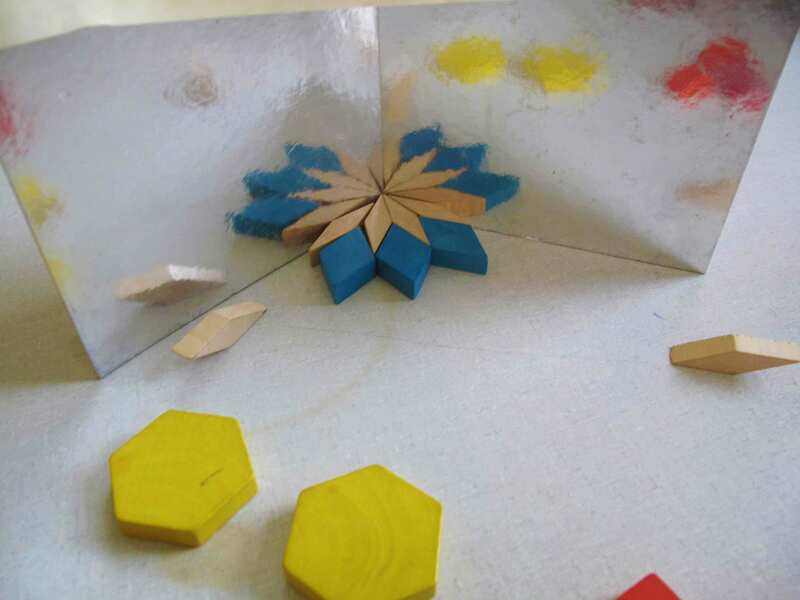 After awhile we realized that the designs could be reflected from multiple points, which created different results. 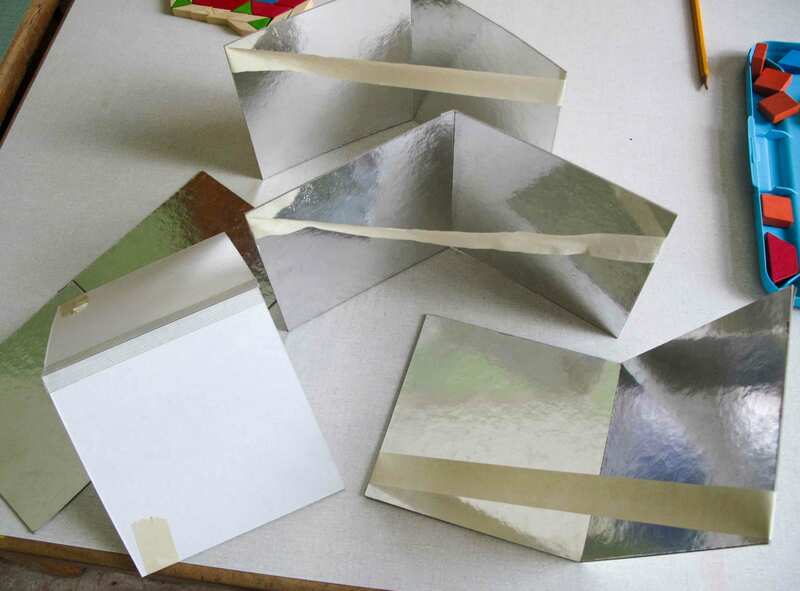 We also looked at different images made by adjusting the angle of the reflective boards. 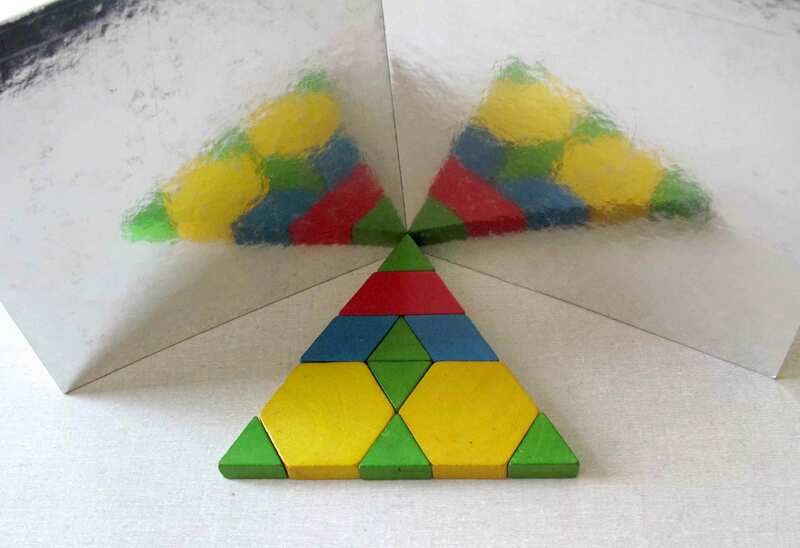 Now prepared to be amazed by the different looks this triangle makes. 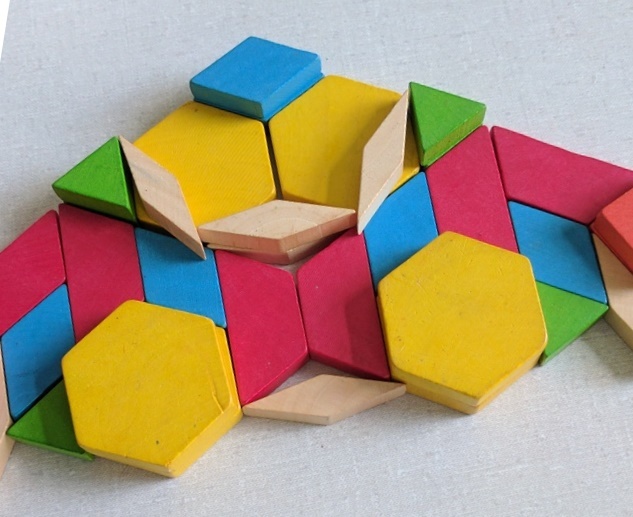 Even as we created more and more complex designs, the thrill of the simple designs didn’t fade. 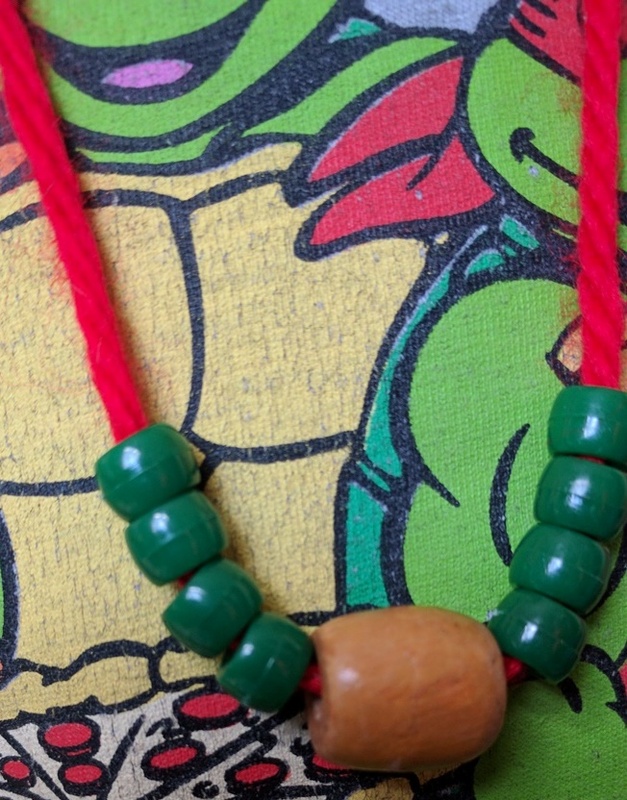 When we had exhausted ourselves with building, it was time to make beaded necklaces. 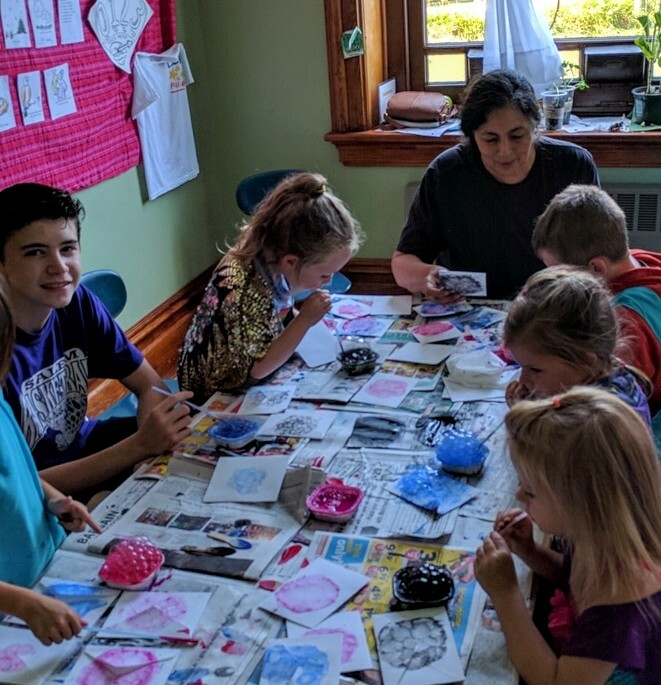 This is the fourth time I’ve worked with these children, and each time I make a different necklace with them. 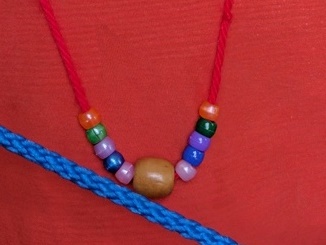 This gives the kids an opportunity to practice counting, to use fine finger control, and to practice making knots. This day, though, we included talk about making a symmetrical design. 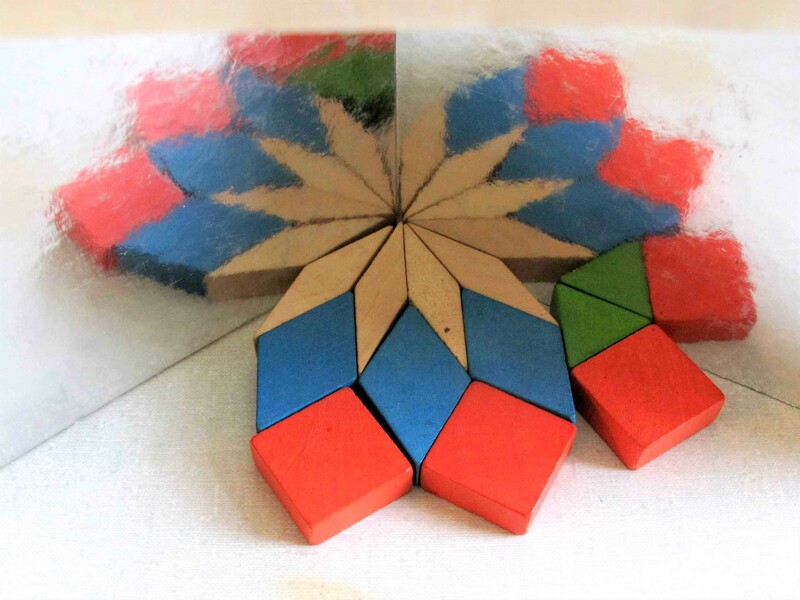 I offered these children a choice of three kinds of symmetrical patterns to do. 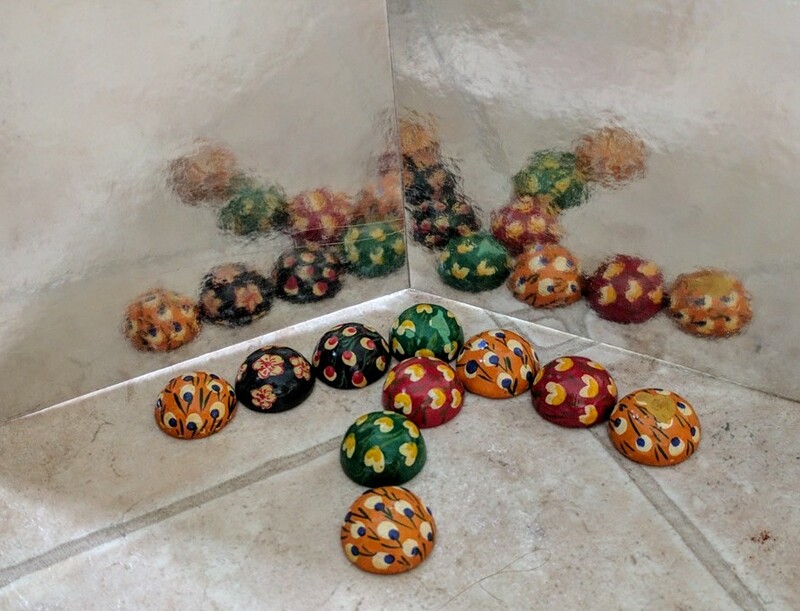 The design that I didn’t photograph was pattern of two alternating colors with a large wooden bead in the middle. I’m pretty sure that the ideas I was presenting to these kids was mostly beyond their ability to fully grasp, but they had such a good time playing around with these ideas, and seemed so engaged and excited by them that I have hopes that something about all of this stays with them in some way. 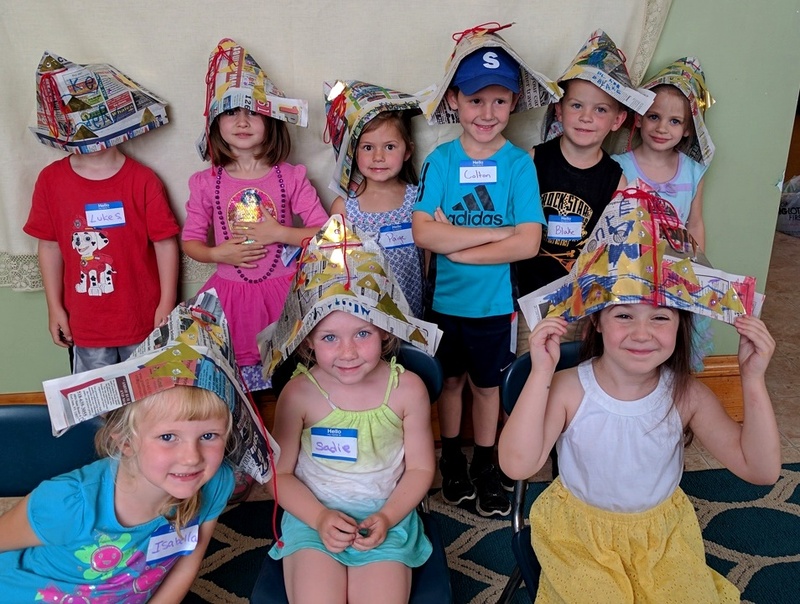 The local program for rising kindergartners has begun, and once again I get to hang out with these kids, once a week for 6 weeks, doing all sorts of explorations that have to do with paper projects, with relationship thinking and with numbers. This group of kids, about 15 of them, seem to have a good grasp of number recognition so we’ve jumped right into playing with shapes. Circles, squares, rectangles, and triangles are already part of these kids vocabulary. One boy volunteered the alternate name for diamond is rhombus. I’m going to have to work hard to keep ahead of these young scholars. 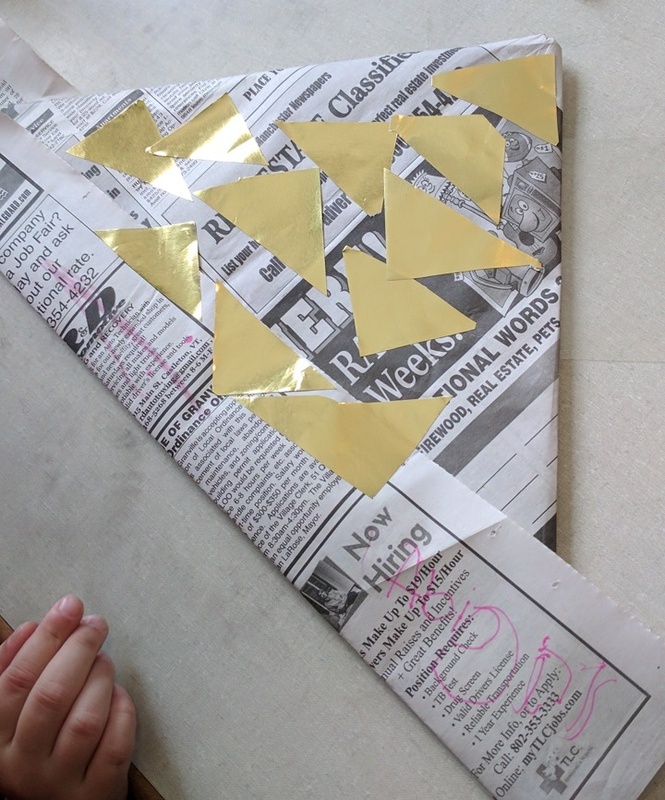 Since our first project was going to be making a paper hat, we talked about triangles for a good bit. 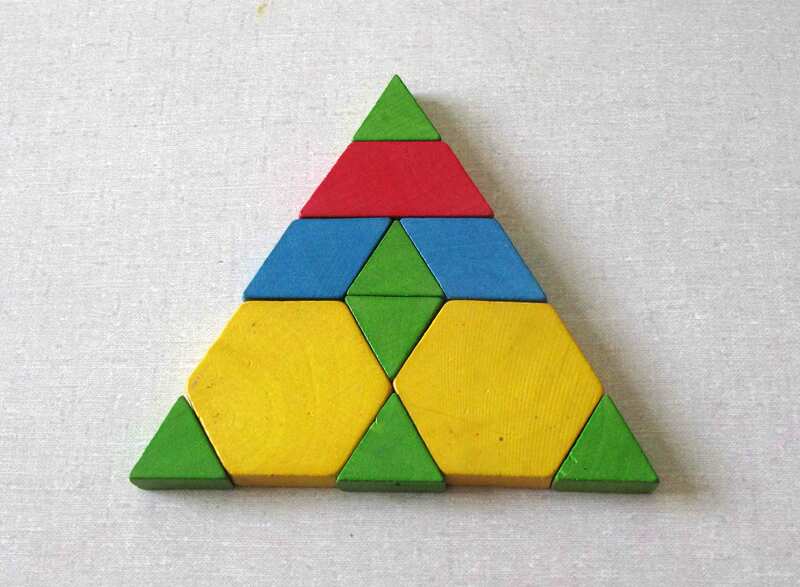 Some schools that I work with don’t want children to talk about all the different kinds of triangles, as the only one the kids see for quite a few years is the triangle with equal sides. The kindergarten teacher from the local school gave me the go ahead to talk about all kinds of triangles, so that’s what we did. I heard some really interesting comments from the kids, comments that got me thinking about these shapes in ways that I hadn’t considered before. 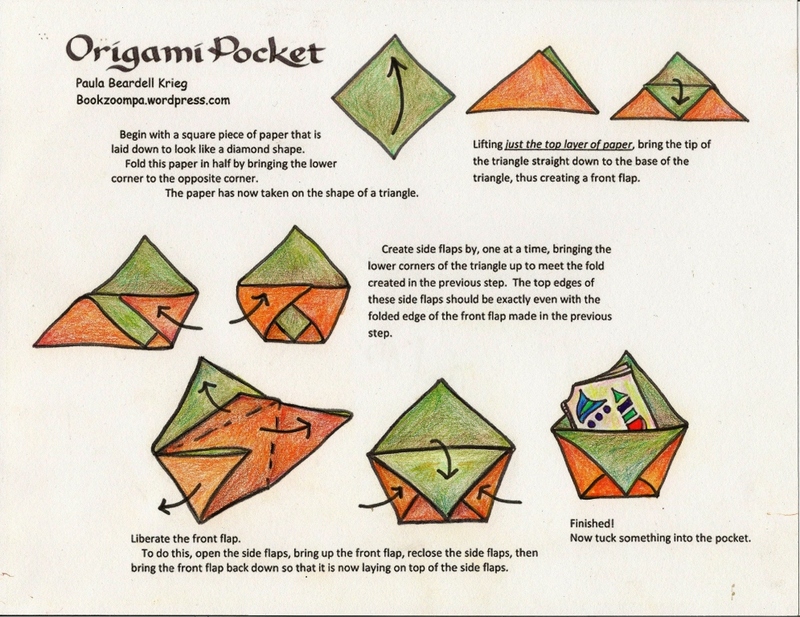 There was some hesitation from the kids about saying that differently proportioned three-sided shapes were all triangles. 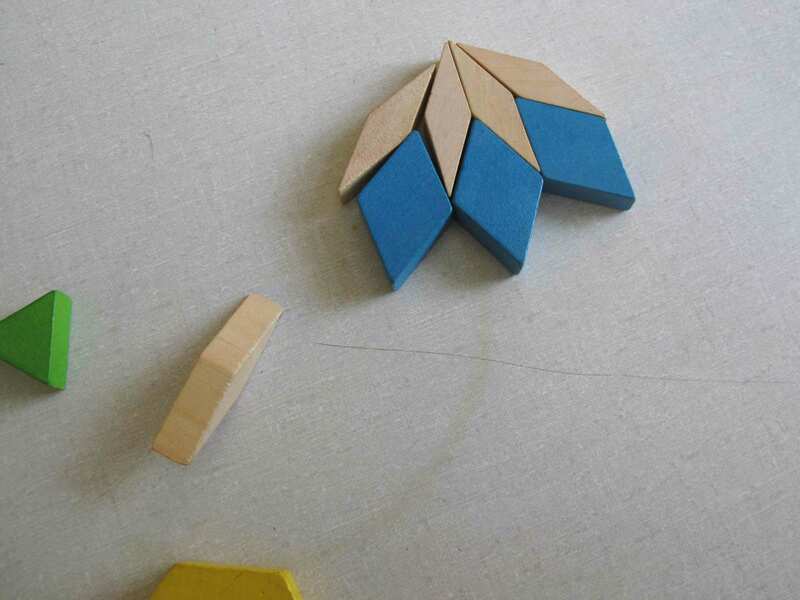 Then one boy pointed to differently proportioned triangles and suggested that these are different sides of a triangle. 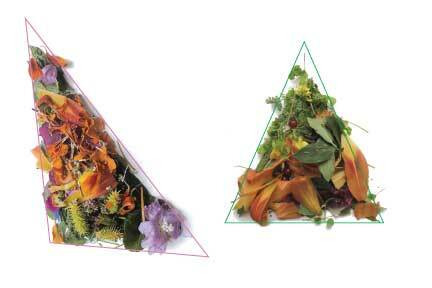 This got me wondering if different triangles could be seen as the same triangle seen from a variety of vantage points. 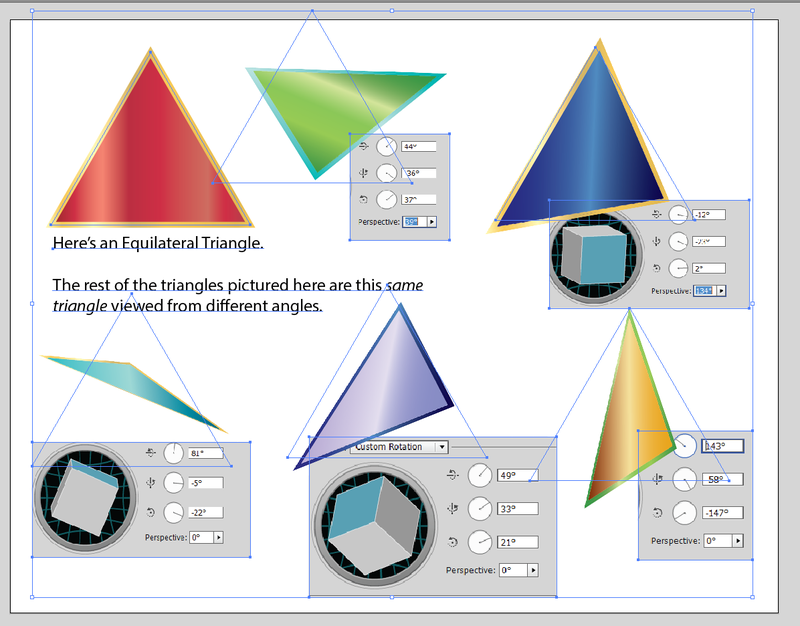 I came home and tried out rotating equilateral triangles in my Adobe Illustrator program, and, oh my, yes, seeing the same triangle from multiple perspectives gave the same triangle different appearances. What an interesting discovery! Each child received this array of jewels to use as decoration on their hats. 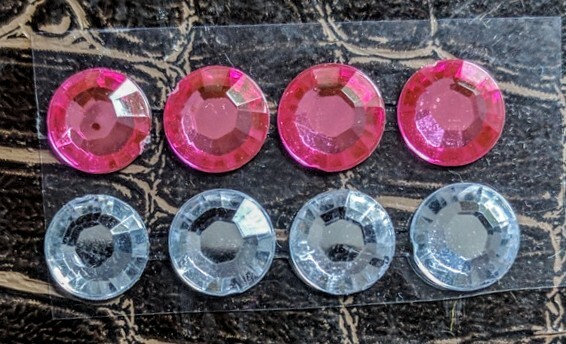 I asked them to please count the jewels that I gave them to make sure that they each got 8 of them. These children recognize the number 8, they can count to eight, but they counted the amount in the photo above as 6 or 7 or 9 jewels. This was good for me to notice, as it will inform planning for my next session with the kids. The hat making went well. 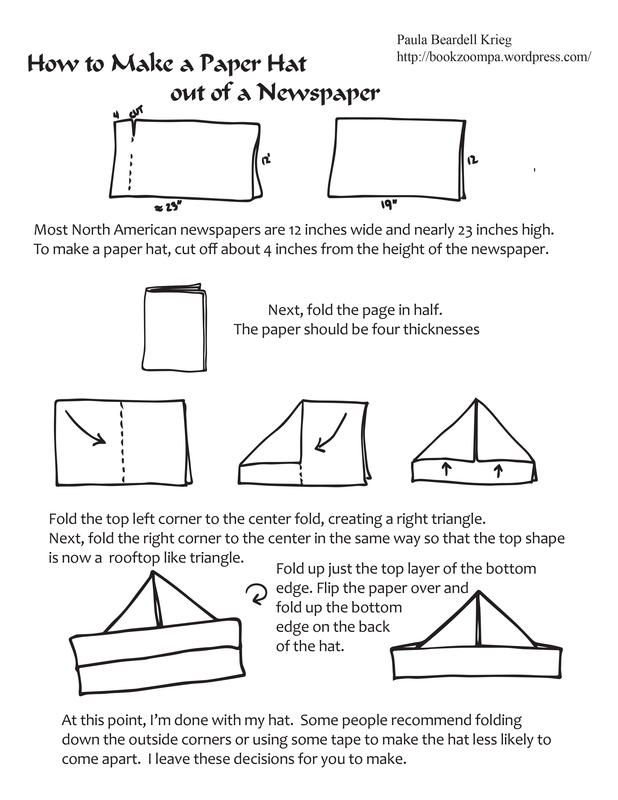 I will likely do some kind of paper-folding every time I meet with these kids. Next (well, after a snack) we went outside and played with the shapes that are featured at the top of this post. 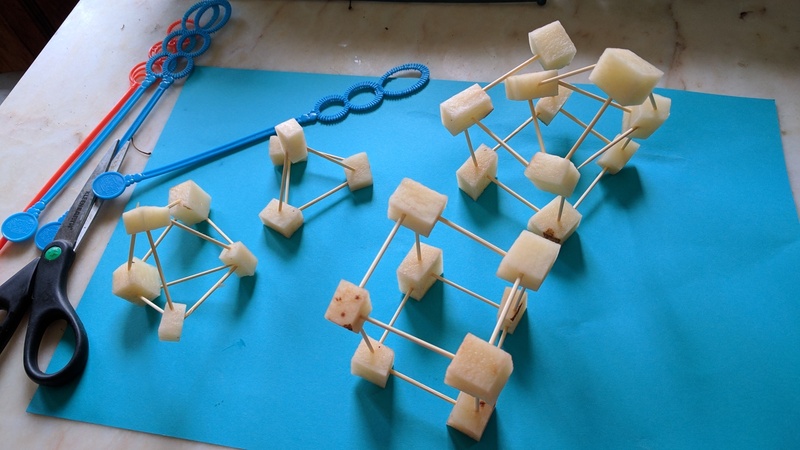 The shapes were created with cubed potatoes and toothpicks. 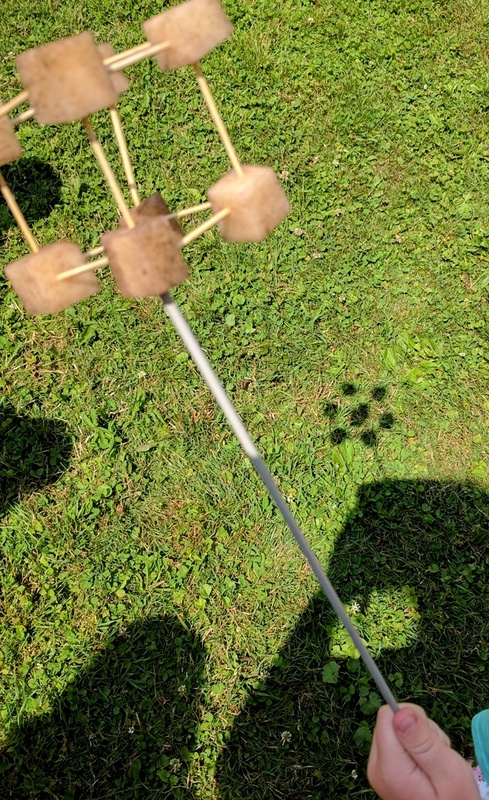 We talked about what their shadows might look like, then, mounting them on a knitting needle, looked at all the surprises that showed up on the ground. This was such a great activity (as long as the sun was shining.) It wasn’t easy for them to get this flower-like shadow, but they badly wanted to create it, and did, discovering lots of other surprising shadows along the way. One thing I told the kids at the outset of this project is that Mr. Lawler had warned me that the kids would want to pop the bubbles as soon as the shape emerged from the bubble mixture, so I suggested that we do some running around and popping bubbles before we moved into the observing part of this project. 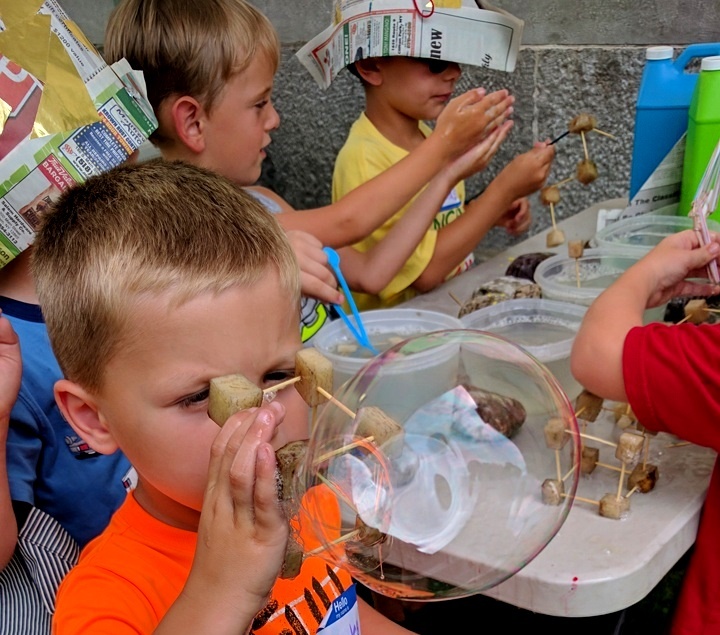 These 4 and 5 year-old were aghast at the suggestion that they might pop the bubbles, and assured that this would not happen. Unbelievably, they did not pop the bubbles. 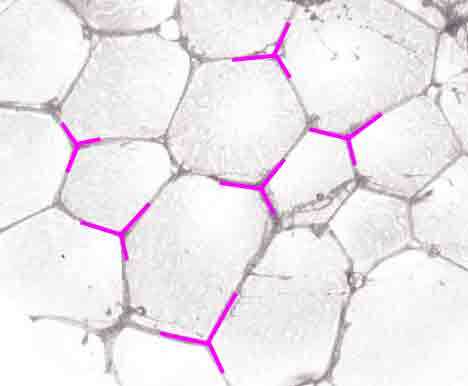 What shape bubble does a cube make? Instead, then blew into the shapes and created more bubbles. 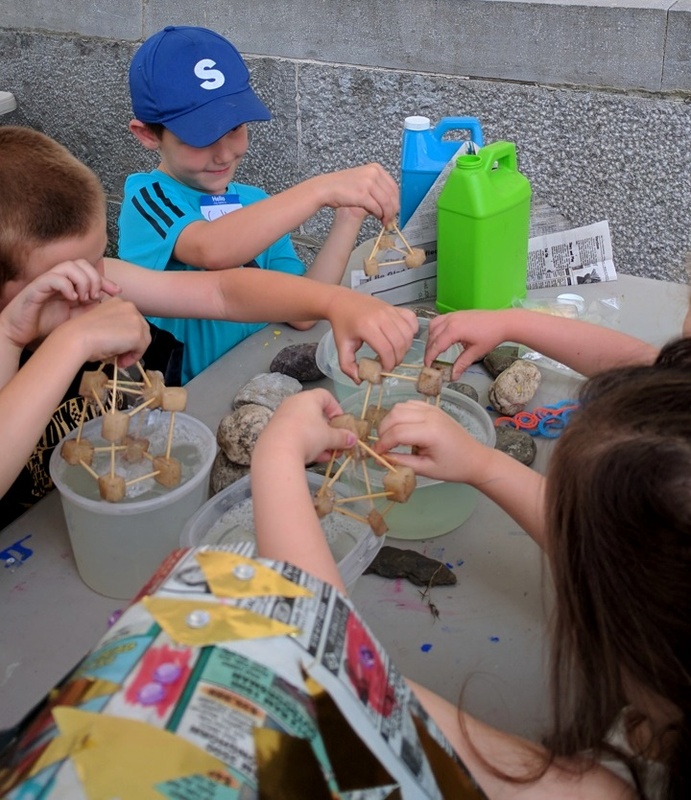 What shape bubble does a tetrahedron make? 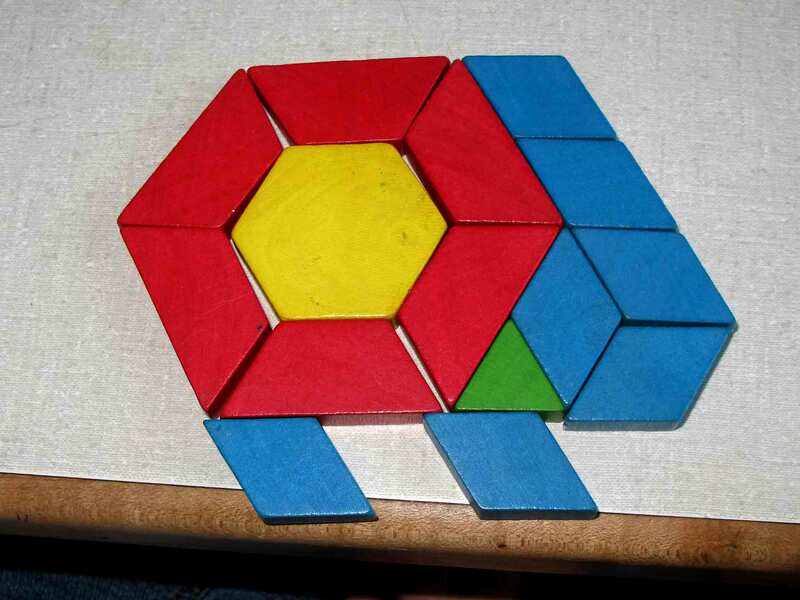 When the cube broke apart, bubbles were blown through square shapes. And then it was time for another snack. I’m loving this time I’m spending with this age group. This morning I came across this video by dad and educator Kent Haines, that I wish every parent would watch. 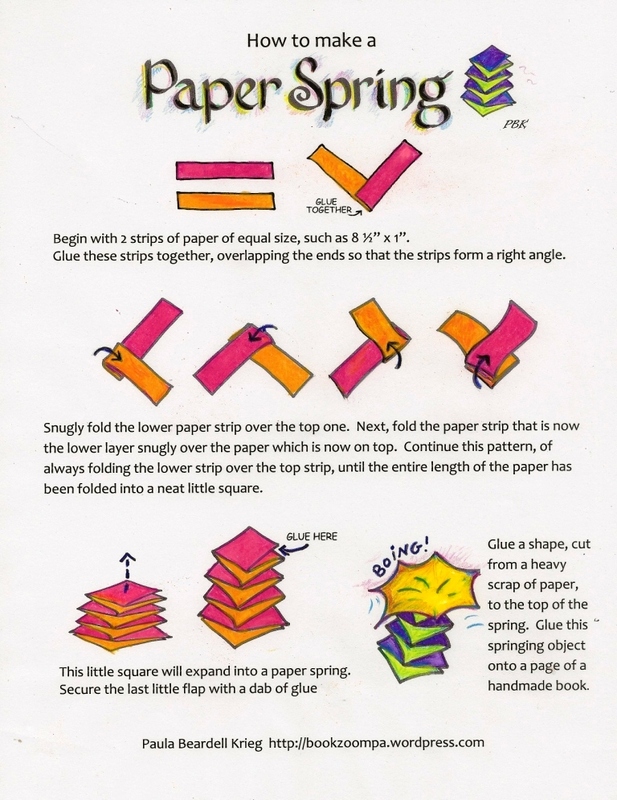 The next few weeks these kids and I will be talking about numbers, shapes, how when one thing changes, another thing changes (especially with shadows), we’ll be getting those little fingers to fold paper, attempt to tie knots, make patterns, and run around and have fun.